Collection of classical hymns on Lord Shiva written by poet sage Manickavasagar. Recreated as the first Indian Oratorio by music maestro Ilaiyaraaja. Names like Stephen Schwartz and Lászlo Kovacs are known to music lovers all over the world but I have a feeling that Ilaiyaraaja, the composer of this oratorio, is not so well known outside South India. His Tamil compatriot A.R. Rahman has broken into public awareness far better with his breakthrough film soundtracks like Slumdog Millionaire. 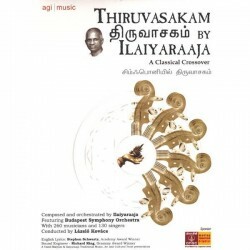 But both are regarded equally illustrious composers here in South India, some even taking the side of Ilaiyaraaja as the foremost Tamil composer and contender for the title of Mozart of the East; possibly a silly title but one that reveals the affection both enjoy in their native land nonetheless. Ilaiyaraaja being twenty years senior, launched his career a few decades before A.R. Rahman, who in fact started off as a keyboard player in the formers orchestra at the age of 11. I could go on about how loved and respected Ilaiyaraaja is in his home state of Tamil Nadu, but I will leave that to you to discuss with the next Tamil person you happen to meet. A wonderful topic of conversation over coffee. No need to thank me. On first impression I’m reminded of some early 20th century vocal symphony except with the chorus and soloist singing in Tamil instead of German or Italian. The first movement (Poovar Senni Mannan) lays out a pleasant sonic landscape that is waltz-like and carefree, yet the next moment we are sidetracked towards a slightly darker slightly Stravinskian rite of some denomination, Ilaiyaraaja himself singing the main theme of the poem in Tamil while the massive chorus echoes an ominous motif behind him. The stage is set for worship of an ancient deity. The pilgrim starts his progress. The second movement (Sivapuranam) is the heartpiece of this work both musically and as far as the devotional drama is concerned. A rather romantic feel ensues invoking visions of Tchaikovsky and early Sibelius. Roy Harcourt joins in at this stage delivering the first English lines of the oratorio his voice blending seamlessly with the whole. There are a few fleeting moments here which remind me of a Broadway musical rather than an oratorio in the classical sense but I don’t mean that in a bad way. Especially for Indian audiences who have not all acquired a taste for western classical singing this is probably a good choice and surely intentional of Ilaiyaraaja. A certain amount of popular elements have probably helped to endear this oratorio to a wider audience than would otherwise be the case. Hopefully this will help to some extent to cross the bridge dividing western classical and Indian art music. There have been other more serious works in this line too, notably in recent times by L. Subramaniam and especially Eero Hämeenniemi from Finland (click here for my review of his CD ‘Unmatched’). Some decades ago Ravi Shankar also composed his Concertos for Sitar and orchestra, which are certainly worth a listen, as are the orchestral works of Amjad Ali Khan. The choral passages are impressive and the sacred mantras of Shiva sound quite breathtaking. This movement is the one that will win the audiences over east and west. There are moments that make me feel I’m witnessing a spectacle alá Cecil B. DeMille, which I mean in a good way, as it invokes a feeling of grandeur and solemness. The third movement (Pooerukunum Purantharanum) is shorter and lighter giving the listener somewhat of a breather with it’s carefree mood and danceable qualities. But before soon we enter a more sombre fourth movement in which the pilgrim seems to be taken over by melancholia if not even slight despair. A very moving piece of music that brings shivers to my spine. I almost want to dash out of the door to find the nearest Shiva temple and propitiate the ancient god of the ascetics; lord of creation, preservation and destruction. The fourth movement is among my favorite moments of this magnificent work and shows the deep understanding Ilaiyaraajaji has of western classical traditions and how seamlessly he blends them with Tamil sensibilities is nothing short of wonderful. The whole movement gives the impression of a long orchestral prayer as the pilgrim appeals to the deity of his choice as given voice by Ilaiyaraaja. The fifth movement (Muthu Natramam)) brings celebration back into the pilgrims heart as if Pongal (Tamil harvest festival) had just begun. This movement is mostly sung by a chorus of female voices in Tamil with male voices joining in towards the end. The sixth and last movement (Putril Vaazh) is a happy and certainly somewhat tongue-in-cheek with the Ilaiyaraaja playfully engaging the orchestra by chattering a bit (please, someone Tamil speaking tell me what!) and then continuing to sing a lullaby-like theme of almost childlike simplicity. The feeling prevails that the pilgrim has reached his destination and calm contentment has possessed his mind. Shiva resides in his heart now. Rather than ending in fireworks the piece ends calmly and almost abruptly leaving the listener humming away the last movements infectious theme for the rest of the day. One evening while sitting for dinner at a restaurant here in Chennai, I perked my ears as I heard the familiar tunes of the oratorio blending with the cozy atmosphere of the eatery. I smiled and felt happy that even in these days of short attention spans (mine is like that of a humming bird) and even shorter pop songs (nothing wrong with them) people are still willing to listen to and appreciate art music. This composition and international collaboration is a cultural deed to say the least. The Tamils are rightly proud of their revered Ilaiyaraaja as they are of their great poet sages like Manickavasagar and Thirumular. Here an ancient yet alive and vibrant culture finds new ways to manifest and speak to the people of our age. I have always loved the sound of the Tamil language and as great world language it has finally been done justice by Ilaiyaraaja in this oratorio. I think it would be redundant to say that Kovacs and the Budapest Symphony Orchestra sound marvelous as always. You can listen to the second movement here: 2nd movement – Polla Vinaiyen (Sivapuranam). You can buy this CD from the Amazon powered shop on these pages by clicking here. Wov that is amazing. I am seriously proud as a Ilayaraja fanatatic and tamil as well. What? did not u listen the sixth one called ‘Putril Vaazh’.? BTW Where u are in Chennai? Thanks for the comment Sanjeev. My apologies, I entered the names and sequence of the movements last and got the numbering wrong 🙂 It’s corrected now. At the moment I am living in R.A. Puram in Chennai. Btw in most places what you identify the voice of Madhu Balakrishnan is that of Ilayaraja himself ! Most notably in the 4th track (umbargatkarasE) which you like best. He has a unique and excellent voice that somehow stirs up an unease in the lay listener. In final track it is Ilayaraja who is talking. Essentially he is pretending to get introduced to the sounds of the ‘symphony orcherstra’ and choosing the appropriate lines from Thiruvasagam that best fit a tune he has in mind. He first picks and discards one and then settles on “putril vaazh aravum” – giving us the impression of seeing it as the songs comes to life. Excellent piece of writings putting your honest feelings on the musical by Ilaiyaraaja. Hope the musician within you has helped to identify this unique venture of Ilaiyaraaja. Hope you had/will have the opportunity to listen to his other albums like “How to Name It” and “Nothing But Wind” also. Like you have seen and felt the India here now, he has felt and presented the oneness of all forms of music with the Tamil/Indian music base. to listen to his highly individualistic and uplifting music. and I am for the past 6 yrs listening Thiruvasagam. Always nice to read comments and feelings on Ilaiyaraaja and his music. Thanks to everyone for the suggestions and links. Keep them coming. I am still exploring his music myself. for a movie song, he listens the situation given by director, in a fraction of seconds he starts composing tunes for that situation, no man usually does it ..very instantaneous..
for a BGM of movie, he sees the seen once, starts givin notes to orchestra peoples. never asks for time to compose music. i worship him, he is more than any one in this world to me.. Thank you for your comment Shiva! Ilaiyaraaja is indeed unique among composers and i feel i have a lifetime ahead exploring his music. I hope to write more about him in the future and, if higher powers will, even interview him personally. All the best to you my friend. Thanks for the wonderful review. One can feel the divinity flowing on hearing this music and of course the lyrics too. My personal favourite number is polla vinaiyen which I hear daily. One of my ambitions in my life is to learn by heart all thiruvasagam songs. I ve started my work 15 days back after I went to thirupparaaithurai shiva temple and sought the blessings from the statue of manickavasagar to begin with. Now I ve learnt till 205 lines of that wonderful book. Still going on..way to go. But I hope I’ll finish it by lord shiva’s grace. Thank you for sharing with us! May you have the grace of Lord Shiva to successfully memorize all of the lines. Let us know when you have accomplished that. excellent piece of work. it brings our soul to heaven. I always admire…..I love it very much. the young generation admire the classical texts through this composition. Siva blessed me to hear Raja’s Thiruvasakam only very recently and by the way mostly all Raja’s songs are soul stirring. the commentator could have taken a help of a classical singer who could have identified the clasical Ragas that were used int the celestial composition..1500 years old TAMIZH needs translation for the contomporary TAMILANS. (includs me as well) I just was slightly disturbed by 2 am heared Raja’s Thiruvasakam he/Raja pooed my bewelderment and now feel comfort let me sleep for some time நற்றுணை யாவது நமச்சிவாயமே good night and rather good morning. This is music for the ears. I have listened to it for the last two years. Kindly help me to get the Tamil lyrics with meaning in English. Ilaiyaraja’s rendition of “Thiruvachagam” brings tears to my eyes and shivers to my spine.”Awesome” is a small word for it. My guru, Bhagavan Ramana Maharshi had the highest regard for this magnificient poetic work. I am lucky to have visited the spot where this was composed, i.e. Chidambaram Temple, in 1999. I am trying to learn Tamil, but till that time, can anyone guide me to the transliteration and meanings of these lyrics ? (I have read a part of GU Pope’s work).